We've something to give you a little giggle this weekend, with the sweet tale of a young boy who believed that the Gameboy Micro was the latest Nintendo handheld on the market. Gamer dad Andy Robertson and his son were walking past a second hand store when the youngster spotted a Gameboy Micro sitting in the window. He was somehow convinced that this handheld console, which was actually released in 2005, was an upgrade to the 3DS; and made sure he would get his hands on it one day. He began some household chores, and little after a month, succeeded in gaining enough money to go out and purchase the handheld. What comes as quite a surprise, is that the realisation that this was not in fact a 3DS upgrade didn't seem to phase Andy's son. His enthusiasm could not be punctured, and was overwhelmed when the shop assistant gave him WarioWare Twisted! 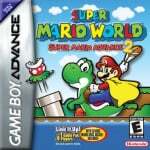 and Super Mario Advance 2. According to him theses games are proof that the device is recent, as they are ‘'too good to be on the DS". He also convinced his classmates and brother that they should put the device on their Christmas wishlist this year. If there's no increase in 3DS sales towards the end of this year, you'll know exactly why. Games are games! Doesn't matter the system, as long as they're fun and timeless. Stupid young boys, sabatoging Nintendo's 3DS sales by feeding the evil second hand market with his hard-earned cash. I would almost feel bad for the lad, if he wasn't such an oblivious gaming glutton. Ignorance is bliss! It really is true. Dumb people are cute when they're dumb. It's pretty cute to me. Reminds me of when I thought the GBC was the king of everything when it was in my hands. He'll learn soon enough, but for now, ignorance is truly bliss for this lad. Whoa. Some venomous bites there, peeps. Kids say the darndest things! With their hippin' and their hoppin' and their bippin' and their boppin' so they don't know what the jazz is all about, yazee? @AltDotNerd: You just made my day! Pokemon!? Pokemon with the poke and the mon and the thing where the guy comes out of the thing, and he makes a fraaagh fr fra aagh aagh aagh! Reminds me of my youth, when all I had was a GB Pocket, and everyone else had GBCs. Just like that kid though, I didn't care that I didn't have the latest gadget. I could play awesome titles like Solar Striker, Pokémon Red & Silver, and Kirby's Dream Land, and that's all that mattered to me. @SanderEvers I was thinking the same thing. If I didn't know better I would have thought that this was a relic form the 80's with that design.I remember reading a comment on here from someone who thought it was a prototype DS,correct me if I'm wrong? Wario Ware Twisted really should come to the 3DS, it has the hardware to do it ya know! Reminds me of when I was younger. When you weren't following the hype of the most recent machines, and when I was no more impressed with the first Sonic the Hedgehog than I was Paperboy. At least he'll enjoy the games for what they are, rather than being distracted by the hype of the unreleased. Reminds Me how I played the gane boy for years before ever seeing or hearing of a gba or a gba-sp. I subscribed to nintendo power a year later, so problem solved. @AutumnShantel Ya and I still have a gamboy sp. I play it and my 3ds. I'd probably get one of these depending on the price. I'd still remember playin super mario advance and pokemon leafgreen on gba.....then i sold, and typing this comment on my 3ds. He's actually a Sony agent in disguise, hired to sabotage 3DS sales this year by convincing everyone the Gameboy Micro is more recent and that they should purchase that instead. Well, its nice to see something newsworthy on the weekend. how old is this kid? oh, and you misspelled "gave" in paragraph 4. it should say the shop assistant gave him, not game. People always ask me what it is, and they don't believe it's a Gameboy. Its plausible. I grew up thinking that the SEGA Genesis was the newest console back in the gamecube/ps2/xbox era, with out knowing that those other systems existed. I'm jealous of that kid, I wish i had one of those. I think this kid is stubborn, not dumb. It sounds like he's convinced himself that it is the newest thing and refuses to believe otherwise. At least he has a collector's item lol. micro is awesome, a lot of people missed out on it, it is so small you dont even notice it is in your pocket, go get one! The micro is awesome and these games are great, so he's smarter than you think. The micro may not have sold well but boy I loved it! It was so cool and even had interchangeable faceplates...why Nintendo never followed suit with the feature on the 3DS beats me! Some GBA games are too good to be on the 3DS. In a way. I find this very amusing though. Someone get this kid a 3DS XL! It's too bad you can't play the old game boy games on the micro. The effect of Twitter on Entertainment News..... this was originally posted on Wired in April. Then random girl tweets it out, and all the game sites pick it up. Interesting. An awesome story. Just funny how and when things like this make the rounds. I wanted the Famicom Micro so bad, but always had too many bills. I guess now is the time to start hitting up my local used game shops for one. That was one of the best "mistakes" this kid could have made. I bought my Micro a little over 5 years ago, and that was my most recent handheld purchase. I seriously doubt I'll ever buy another handheld game system because I am more than satisfied with my Micro. I still buy GBA games on a regular basis. Love my Famicom Micro! I'll get mine charging today. Thanks kid! And since I just lost my ambassador 3DS the other day, I may as well trick myself too. I'm sorry, but that kid is an idiot. Does he know what graphics are?? I have a little brother and he likes games like I do, and I taught him about graphics when he was six. He already could tell what graphics were good and bad, he just didn't know the term. @SonicMario Or that Gameboys predate the 3DS. You gotta give the kid some credit, he knows whats up. As long as the games are fun it doesn't matter what you play them on. I get just as excited when I find retro goodies at thrift stores as I do the latest games and consoles. I'd like to see the look on his face when he finds out that not only is it not new but that its quite the collectable and many gamers would be green with envy. I'm rather surprised the store held onto it that long though. I didnt there was a gb micro and that this one is newer than the advance but I dont kno why but it looks cheaper. Seeing as this is the one Nintendo handheld I don't have in my collection, I'm a bit jealous. What a find! I'm surprised at some of these comments. He's just a child, guys. If you're really that fast to call a child "stupid" or such, I doubt you'd have the patience to be a parent. Its hard to find a gameboy micro nowadays. Is it seriously enough to call a little kid stupid or an idiot ? Wow the irony of some of the comments. He's a kid, do you honestly think he cares about any of the stuff you just said about " OMG the graphics"
The fact that the kid got a handheld that is very rare and was only in production for a hot second is quite good despite him being wrong about the 3DS being outdated. He's a kid he only cares about playing games, I'm sure he could careless about uber graphics and features. My god fanboys are ridiculous. lol, i kinda wish i had one just for heck sake. The only reason I never got one is because it couldn't play my small collection of GB games. Though I must say this kid did one hell of an overhaul with his cognitive dissonance....also not everyone is suited to be a parent these days. I wonder how much he actually payed for it being as hard to find as it is, after all it took him a little over a month to save for it. Being from a thrift store theres no telling how much they charged for it, I've seen regular GBAs go for around $10 but they wouldn't know what its worth. SonicMario said:I'm sorry, but that kid is an idiot. Does he know what graphics are?? I say: sir, HOW DARE YOU CALL A LITTLE KID AN IDIOT.> I think cave story ds graphices are Boss, Does that make me an idiot? @Orla_Madden The word gave is mispelled as game in the second to last paragraph. "The shop assistant game him..."
@X the Fox Does that make me an idiot? one has to be careful asking questions like that here: there are now those with attitudes that will answer. Exactly! Doesn't matter how good the graphics are, as long you are having fun! Bought my Japanese Famicom Micro NEW last year for $90, price soared for new devices after that. This article is making me want to make a custom faceplate even more! Kid probably thought the Micro was the latest Nintendo handheld because it was so well designed and so well built. Really helps that it's the only handheld with a metal casing and also is the most attractive Nintendo handheld ever created bar none. Basically I just really love this thing, wish I could get the cobalt blue Final Fantasy 4 Micro that only Japan got so I would have both a red and blue Micro. It's one of those handhelds where you just want to own more than one of. @Knuckles Thanks for pointing that out dude, sorted now! And thanks for the welcome, happy to be part of a great community! @dudey300 Your Welcome, and enjoy the community! We don't bitemost of the time! I have no problem with the kid using a gameboy micro. It is amusing, but there are some great games for it. Wait...Nintendo fans saying he shouldn't like the system because of the graphics? I like Nintendo (more then I really should), but the Wii is underpowered compared to the other systems, the DS was underpowered compared to everything and the 3DS is underpowered compared to the Vita. You guys should know that doesn't matter if the gameplay is good and the game isn't ugly. That said, this kid made a great choice! The Micro is a fun little system, you can hide it damn near anywhere, and the GBA has a pretty solid library of games to choose from. I miss mine a bit, all those late nights playing it!!! This story is brilliant, so full of twists and turns and unexpected drama. Its amazing. @SanderEvers true... the gameboy advance was the last nintendo handheld to sport the name gameboy..
@theblackdragon Agreed, the Micro is a seriously awesome little handheld!! I remember when I used to sneak my micro in school and play it never got caught.I can't believe hes never seen a 3ds commercial on tv though maybe he just doesn't watch tv.Either way funny story. Someone tell that kid about Astro Boy: Omega Factor and Gunstar Super Heroes. Classic Awesomeness! @wiiwii That's because the gameboy micro had switchable plates like cellphones do and that plate there is based off the 80's Famicom. Ok it is the last Gameboy, but you're missing a point kiddo. this is rather collector. i would love to have one. but the kid wont laugh so much when he will discovers that mario 3d land doesnt fit into his micro device. 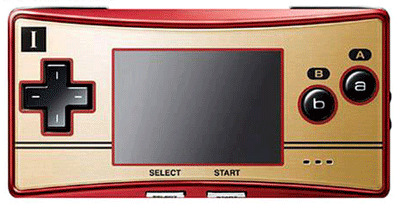 You know why the boy think it was a recent product like a 3DS, just look at the d-pad design on it. Yeap that's the same d-pad as the one on the DS Lite, DSi, DSi XL, 3DS, 3DS XL, Wii Remote, Wii Classic Controller and CCP, Wii U GamePad and Wii U Classic Controller Pro. The Micro was the first portable to give us this amazing d-pad design and now it became a standard in all of Nintendo's controller and portables. BTW, NES is still one helluva sophisticated piece of hardware! The GBA had some pretty amazing games. Games like Zero Mission and Superstar Saga would hold up today (with updated graphics and fit to two screens obviously). True, there were a lot of titles in the mix, but the same goes for all popular Nintendo consoles, and in this case, the average shovelware title was playable. TL;DR: GBA games still hold up today as amazing. Poor guy! Andy should have told him the truth, seeing as he is a gamer himself (am I right?). Well, as long as the boy has fun! 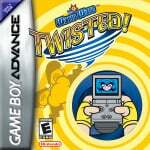 Especially Warioware twisted is great!